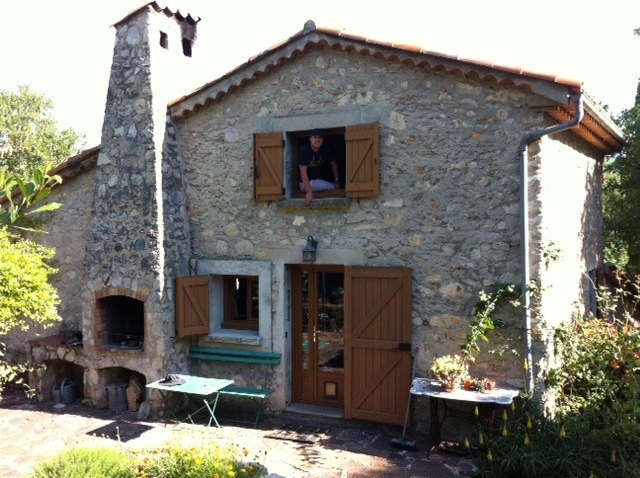 Our farmhouse in Provence. That’s not a gargoyle in the top window. It’s moi. 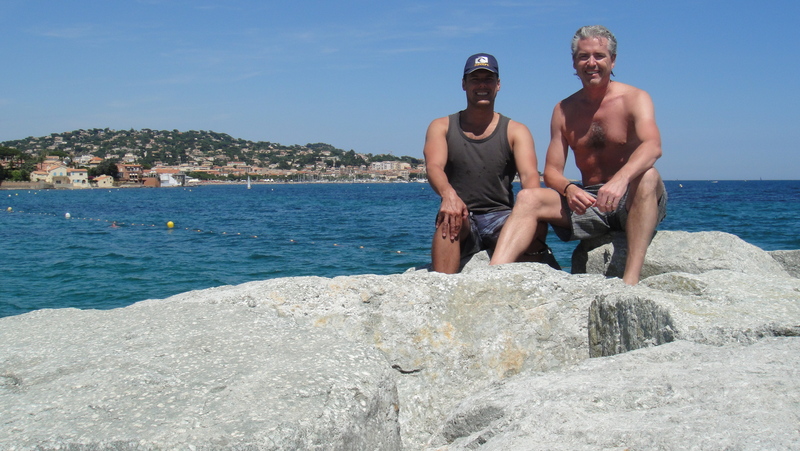 Yep we are in sunny Provence. Sharing an old farm house in a valley of oak and olive trees. Our valley looks up to several ancient medieval villages perched on top of the hills surrounding us. Our area is known for its olive oil and lavender. Thank God, they make a bit of wine as well. In fact, our local butcher flogs quite a good rose for €2.50 ($3.30), which, combined with his great steaks, makes for quite a convenient shop. On our first day here we had an afternoon of BBQs, Chardonnay and Boules, a version of bowls, sometimes called petonque (once again to be said with an outrageous French accent). However, unlike bowls, you throw the heavy metal shiny balls at the jack. The game was invented in the south of France for the men to while away the day, whilst the women picked the olives and grapes. But it hasn’t been all Viognier and Petonque. Yesterday we climbed up a country path to our local village, Callas, which is perched on a hilltop looking down to the valley where our farmhouse and olive grove is located. The walk through the beautiful forest filled with wildflowers was spectacular at first; however, halfway to the top we decided pushing a pram on a rough country path was not a good idea. April, the pram’s passenger, managed to sleep the whole way. (And no, April is not a souvenir Mike and I picked up! We are sharing the farmhouse with my oldest and best mate Erin and her husband Ken, and little April, aka Papadum). We rewarded our efforts with a lunch in the village square. 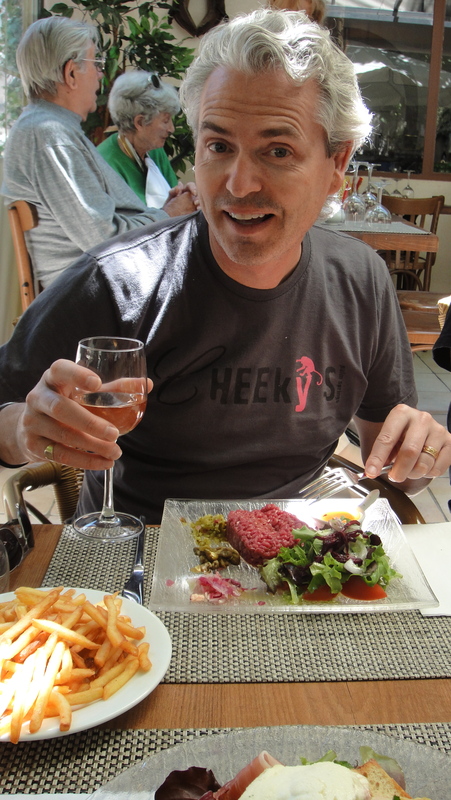 Mike tried the ‘tartare de boeuf’, basically raw beef mince with a raw egg! The rest of us opted for a cooked meal. A wise option as Mike has not been at one with his stomach ever since. We’ve also travelled in convoy to the town of Grasse, the origin of all those French perfumes. On the drive in, the town smelt of flowers, on the drive out it had changed to an odour of nutmeg … Our guess? Expect nutmeg in next season’s fragrances, girls. We then followed Erin’s suggestion of a visit to Biot, a medieval village perched on a mountain looking down to the Mediterranean. We picnicked on food we had bought in the markets. Cheese, sausage and lapin (rabbit). Yep all you fluffy bunny lovers – a roasted rabbit, complete with the eyes, pointy teeth and a little but of fluff on its feet. And guess what? It tasted like chicken (doesn’t most white meat?). I’m still coughing up fur balls. Now we are relaxing under an oak tree after a swim in our pool, with – yep, you guessed it – a glass of cold white wine. La vie est bien (life is good). Love Monsieur Michel Chestois and Monsieur Rechard Arnot (my surname sounds terrible with an Aussie accent, so try the outrageous French accent). This entry was posted in France and tagged Callas, France, Provence. Bookmark the permalink.